This package also covers Voluntary Module FSMA Preventive Controls Preparedness Module and Guidance for BRC-certified Facilities which provides assistance to manufacturing organizations to help understand those prescriptive elements within the FSMA Preventive Controls for Human Foods that are not explicitly covered within the BRC Global Standard for Food Safety. Ensure your Safety & Quality Management System meets a GFSI recognized standard with this comprehensive and easy to use documentation package, which covers all of the requirements of the British Retail Consortium Global Standard for Packaging and Packaging Materials: Issue 5, 2015 for High Hygiene Packaging*. 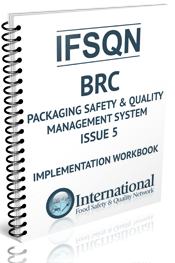 The workbook is designed to assist in the implementation of your BRC Packaging Safety and Quality Management System. *High hygiene - Packaging that comes into direct contact with food products or other designated hygiene-sensitive products (such as those intended for human consumption or that come into contact with the body; for example, by application to the skin). This is an ideal package for Agents and Brokers of Food and Packaging Materials looking to meet the BRC Global Standard for Agents and Brokers. The Standard is intended to assist companies and their customers in meeting the legislative requirements for food safety.